By A. W. Sylvester Alchemy, The explanation never told! The Philosophers Stone, a cure all medicine, Genesis, the pyramid (firmament), the Fountain of Youth, Isis and Osiris, mythology, metaphor and pictorial allegory, Darwin and the Creationists , the yearly cycle (astrology) and lastly, the basis for all present religions and God. The author believes this is the most important rediscovery of ancient material found of our time period. I need to connect with a person or group that can help put together a documentary that can be shown around the world! If you are that person or know him, please contact me to discuss. While at this site, look at the beauty of the alchemical material. All of it can be explained and should be know by those that live today. It is our heritage from the past, and with it the medicine that "cures all ills". 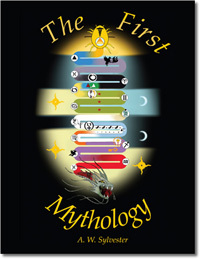 'The First Mythology' Episode 1 from Michael Hanlon on Vimeo. For over 35 years I have searched books and the past trying to solve Alchemy! The magic of the Philosophers Stone. Turn lead to gold! A cure all medicine! The fountain of youth! Was it just wishful thinking, or is there a basis of fact? I soon learned the subject had lasted as a rumor, mythology, or perhaps just as an idea. Something I believed had to be there, something was overlooked. Now, it seems that the something had not been overlooked, instead was hidden from the masses for many reasons. That something will astound you, will surprise you yet you will know it is truth. Who would have thought that Genesis was really about the yearly cycle? That the process of making the stone is really about the understanding of the creation. Also that the stone is about how nature can and does handle matter. Now with art (man and nature), I found more can be done with matter and so perfect it. You will see that matter handled correctly is purified over time and within shape. That shape is a glass pyramid oven. You may know of it as 'the firmament.' This is the magic, and produces a substance that convinced man of God! You will see that this power of generation is the God of early man, and finding the purified matter led to several things. First the process of Genesis, though I am not sure what it originally was called. That process led to astrology, and the naming and defined understanding of those constellations passing overhead. Finally it led to a religion, which was that of Isis and Osiris. When understood you will see that those are the religions of today, and little has changed. You will then know why all of this was hidden from you! Lastly you will know the All and want to make this substance. You will understand that you're a part of, and maintained by this system. That we need to maintain it before we cause it to destroys us! This is then Alchemy understood, the enchanting power of transformation. To those that want to contemplate just how much the ancients knew. Also, just what an egg and the pyramid (shape) is about, please check out this extremely informative site.